Men on the whole seem to be more physical than women, and today is a good time to realize it, looking at wiry, sweaty bodies coming together into highly skilled pyramids in a timeless enactment of a mythological trait. Yet this is a day well condemned for a variety of reasons, most of them a reflection of how our middle classes are rapidly losing respect for our traditions. The other part relates with women’s safety. There is a perception of a lot of physically fit men, high on adrenaline engaging in inappropriate behavior with women. I see this as a good day to look at how we see men and the things they do. Increasingly, the physicality of men is seen as a bad thing. Loud behavior, aggression, ogling women or even simply sweating for the wrong reason seems to be seen as threatening. This morning I was witness to an ugly rant about how rowdy drunk men go around in trucks molesting women and taking risks with lives in the name of culture, creating road blocks and generally being a nuisance. And yet I wonder where these perceptions come from. The team on the truck usually belongs to a gymnasium, which is run like a school, with very respected teachers. They practice for months for the entire team to be able to create those pyramids flawlessly in order to reach a pot that can be hung as high as four stories high. They cannot afford to be drunk and they are risking their very lives for the thrill of challenge and the reward money. They go from one location to another, traveling all over the city, breaking as many pots as they can. Am I saying there are no people drunk? Of course not. It would be stupid to make guarantees of this sort. However, I can guarantee there are far fewer drunks than you can find at your average disco any night. So what is it that makes these people seem so threatening to women? I think a lot of this is class snobbery. Most people learning sport in akhadas come from poor to lower middle class families. Almost all of them are tanned and wiry in stature. The definition of “handsome” in a man is rapidly becoming about bulky bodies, dry skin and wealth. We see these men as alien, and thus a greater threat than your average groper in a disco, who may be obnoxious and swaying as he stands, but speaks English, uses deo and allows us the illusion of “civility” or being in control. It is an illusion. There is a reason discos are seen as trouble spots by cops. It is a place where a lot of people are drunk and loaded with adrenaline from dancing. But they are air conditioned. And we have these strange beliefs that air conditioning makes a civilized space. Think about it. This fits in also with a larger cultural snobbery of thin, wiry men being often from lower castes and menial professions. All this is unconscious. Calculated in the blink of an eye, before we know anything about a person. And then of course, is the de-sexing of genders that seems to be a prevalent “hep” way of thinking. 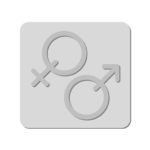 What makes a man a man or a woman a woman? Our minds are so resistant to the idea of acknowledging differences other than those that can be proved biologically (and thus we don’t have to be responsible for thinking them). We are so resigned to not controlling men that we see reject masculine traits. Of course that doesn’t prevent us from being attracted to them or repelled by them. That doesn’t prevent us from juxtaposing our identity against them. Outrage about men ogling women is common. But we take little time to understand why we feel outraged. Would women really like it if no heads turned at their entry? Is this really the vision women have for themselves? That they wander the world unnoticed? If a woman is magnetic enough to turn heads entering a boardroom, wouldn’t she do the same on a street? Why is it that instead of making women feel more confident about their right to attention because they matter, we perpetuate paranoia about attention being a threat? Increasingly, it is seen that men who look working class are seen as “wrong” by default. As if a white collar look automatically also bestows character. Worse, women are actually conditioned to seek approval of such men. To cater to their attention, which compounds the good man, bad man prejudice. The fact remains that a dark skinned, wiry man dressed in a sweaty nylon T-shirt is not necessarily a greater or lesser threat to a woman than one who wears “casuals” and speaks English. This “herding” of women’s preferences leads to great injustice to men who do not fit the “good guy” stereotype as well as women, who are taught to hesitate in a world full of non-ideal men. If women have been exploited over the ages, men are being demonized for not fitting stereotypes. For making public displays of appreciation, for scratching their crotch or looking low class or farting or whatever. This is not about protecting women, it is empowerment coming at the cost of gender relations. But then it isn’t even empowerment to declare the world at large unsafe for women (while recommending that they still navigate it). In the process, what is lost is the actual feat characteristic of this day. Let us not look at all those dangerous men. 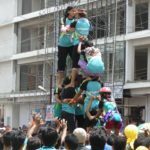 Here is a dahi handi pyramid by girls. Worth a thought. Does it seem that someone with the discipline to do this is more indisciplined and greater threat than normal society?